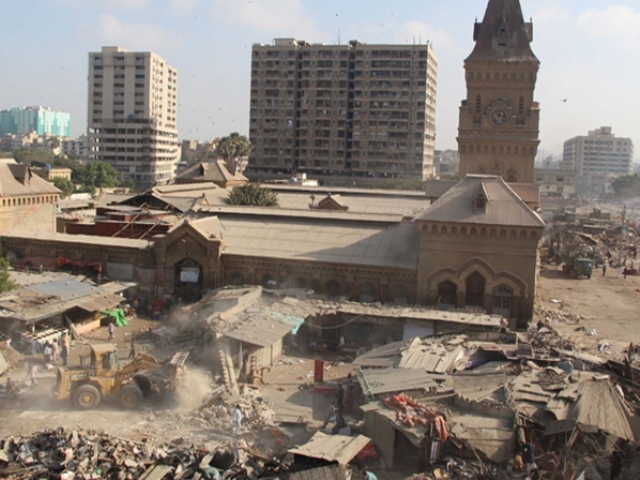 Armed officers and municipal officials equipped with heavy machinery have ruthlessly bulldozed hundreds of shops in the heart of Pakistan’s biggest city Karachi, in a perceived move by the officials to remove so-called ‘illegal encroachments’. The British colonial-era Light House and Empress Market in the heart of Karachi have, for decades, been the beacon of hope for Pakistan’s poor labourers, who converge at this port city in a bid to follow their dreams of a better life. With their deep-rooted culture of tolerance and humbleness, the traders and labourers in makeshift shops around these majestic buildings nurtured a huge following of customers, predominantly from among the poorest living on the margins of the society with no financial means to survive in the rapidly materialised world around them. These shops offered affordable food items, clothes and other household items to millions of Karachiite while also providing employment to thousands. While not all of these small-scale businesses have the licenses or records of paid taxes, uprooting so many lives all of a sudden is certainly not the smartest or sensitive of municipal ideas out there. The government in Pakistan should have instead invested in studying ideas to mainstream these businesses instead of abruptly throwing them out. After all, prior to the advent of multinational franchises in this part of the world, the street vendors have become the hallmark of the daily trade activities in the marketplace. Has the government considered the fact that many of the young and old who were previously earning their livelihood enduring hard labour for decades might now be exploited by criminal gangs? They would certainly add on the already over-stretched social sector. The country can certainly learn, if it wants, from neighbouring India where the parliament passed the Street Vendors Act five years ago, in 2013. The landmark legislation provides institutional power to street vendors and provides them protection. It also stipulated training programmes to educate street vendors on things such as their rights and responsibilities, food safety, hygiene and waste disposal. But it seems, unfortunately, that Pakistan has other plans, perhaps to showcase the two British colonial-era buildings at the cost of livelihood of thousands of its citizens.